So uh….we jumped ahead in our journey. 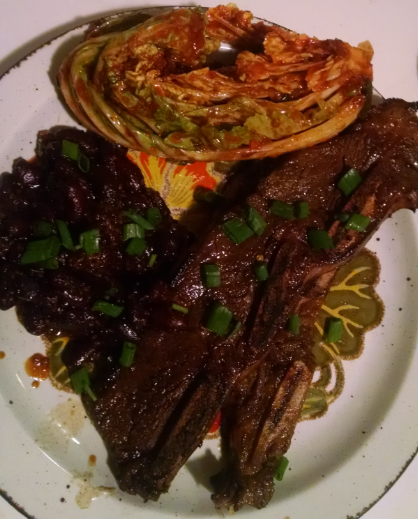 Because, well, Dan was craving Korean short ribs. I’m pretty sure Korean short ribs are at the top of Dan’s “Favorite Meals” list so I was more than willing to skip half the alphabet in order to make him happy. Along with the ribs we also made spicy Korean kidney beans aaaand kimchi!! Oh. My. Word. I think I’m in love. Fresh kimchi is possibly the best thing ever. I’ll definitely be making it again, and soon. All of the dishes were pretty easy to make, albeit somewhat time-consuming. Although the recipe looks complicated, the kimchi was much easier than I expected. We followed this video and recipe from Maangchi – a talented Korean chef who was very enjoyable to watch. I can’t wait to see what other videos she’s put together! Once again, our photography skills are lacking nonexistent. Hang in there! Some day we’ll figure this out. Speaking of pictures, you may notice a hot dog in one of them. Dan and I will put anything and everything on a hot dog, and if it’s spicy or pickled – so much the better. Naturally, we had to make a kimchi dog. Totally worth how stuffed we were after eating so much food. I’ll write a post in the near future focusing on hot dogs and all of the crazy and delicious combinations we’ve discovered! I’m not entirely sure how authentic the spicy kidney beans are to traditional Korean cuisine. Regardless – they were a tasty, easy side dish. There are so many Korean dishes that we still want to try – we’ll most likely post at least once more about South Korea. We’ll also do a post about North Korean cuisine. Although the dishes and flavors are very similar between the two countries, I’ve read that North Korean dishes are generally less spicy and often utilize seafood, broths, and noodles. 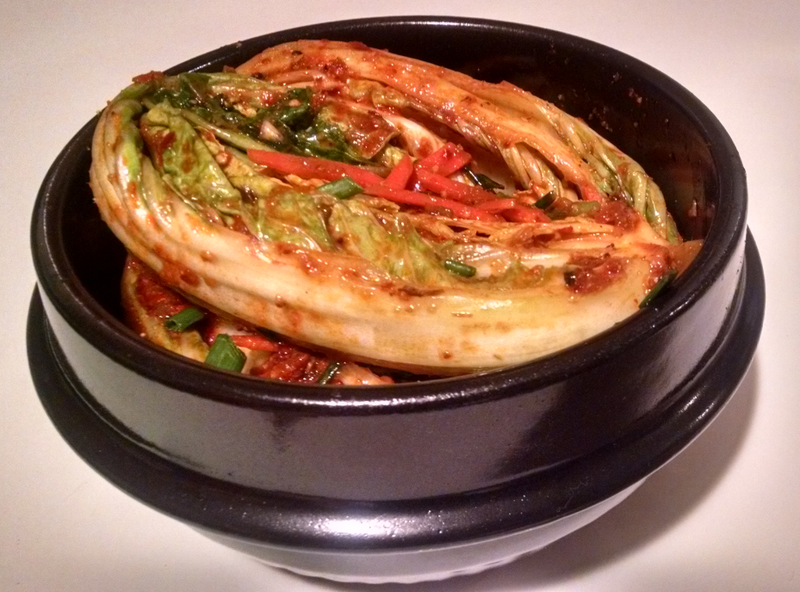 For those of you in the know – what is the one Korean dish we HAVE to try? Combine all marinade ingredients in a medium bowl and stir to combine. Let it sit until sugar is dissolved. Add short ribs and marinade to a large zip lock bag (remove most of the air before sealing). Turn bag over a few times to coat ribs evenly with marinade. When you are ready to cook the ribs, preheat a grill or a cast iron pan to high heat. Cook ribs 3-4 minutes on each side, turning once. Serrano peppers are optional, the longer the ribs marinade – the spicier they will be. 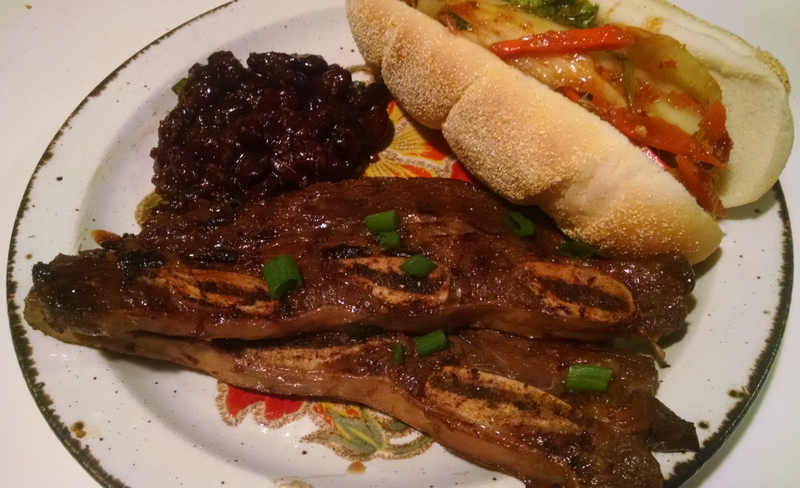 For our beans we used a Soyaki marinade I found at Trader Joe’s. This replaced the sugar, soy sauce, water, and some of the ginger and garlic. Bring to a slow boil over medium heat. Serve as a side dish or over rice. Garnish with green onions.